I’m not sure I’ve ever met a woman who wears as many hats (or tiaras!) as Kathy Louise Patrick. Where to start? Author? Hair salon owner? Literary promoter extraordinaire? I caught up with Kathy—founder of Pulpwood Queens Book Club and owner of Beauty and the Book salon— fresh off her eleventh annual Pulpwood Queen Girlfriend Weekend, a weekend with an itinerary that exhausted me just reading through it. I can’t imagine organizing it. Kathy: This all began under tents in my front yard. That’s right, my first venture as Beauty and the Book, my hair salon/bookstore, had its auspicious beginning in the shop attached to my house out in the piney woods of East Texas. Within a very short period of time we had the Oprah Winfrey organization contacting us to be featured on Oprah’s OXYGEN Network. They were doing a show called “Dallas Style,” featuring Texans who were doing things a bit out of the ordinary. It was mighty exciting having that happen, but I laugh when I tell you I was more excited about who I was on the show with. You see, it was a little unknown singing group out of Houston called Destiny’s Child. Just think, Beyoncé and I had our start at about the same time! I’ve been trying to keep up with her ever since, hahahhahaha! Authors as waiters at Girlfriend Weekend Author Dinner Theater. So I digress, but from that first year under the tents with about 50 authors in attendance and 50 people showing up, we kept doubling in size, so we moved into town. After years of continuously moving to bigger and bigger venues, we have landed at the Jefferson Tourism and Transportation Convention Center downtown and are at capacity. We have been blessed with tons of media coverage and then girlfriends kept telling their girlfriends and, voilà! 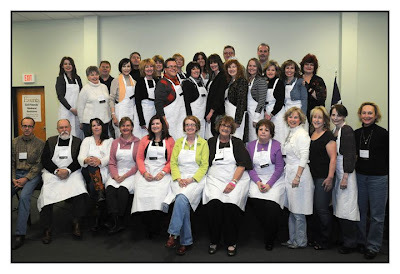 We just finished an amazingly successful Girlfriend Weekend 2011. Pamela: How have you managed to attract such huge names as Pat Conroy, Jeannette Walls and Jamie Ford? I know a few come back every year. Kathy: This did not happen overnight. I had been trying to get Pat Conroy here for 20 years. All I can say is that if you work hard enough and long enough on something that is your passion, eventually your keeping your nose to the grindstone pays off. 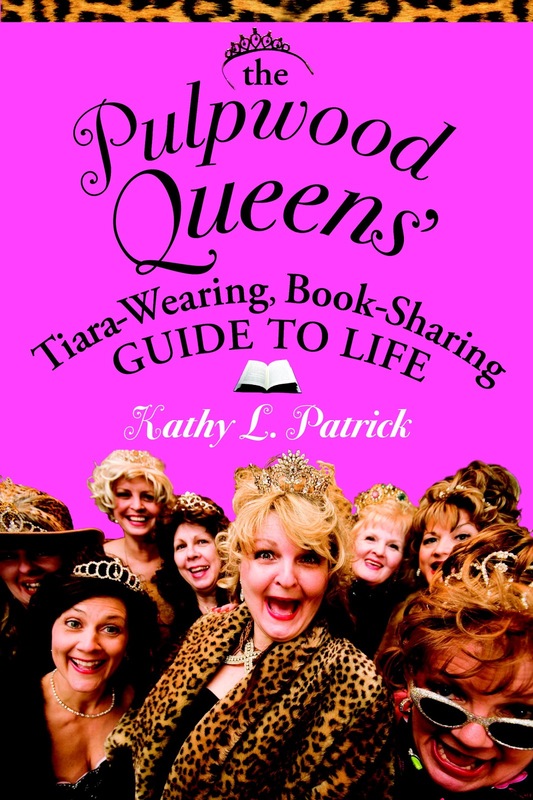 Of course, nothing would have been possible without my Pulpwood Queen Book Club members. What began with six complete strangers has now grown to be 405 book club chapters, making us the largest “meeting and discussing” book club in the world. And it’s a fact numbers talk. We all read the books I select and that seems to encourage the authors and their publishers to send that author to my book club or book club festivals. Then, because they are our book club selections, people purchase the books in droves. And Pat Conroy may be a big name, but Jeannette Walls and Jamie Ford were not when we made them book club selections. They were well on their way, and we just happen to think we gave them a little boost up the bestseller-dom ladder! Pamela: Your latest venture is so exciting: an online book club, Beauty and the Book Show, featuring interviews with Random House authors--Fannie Flagg, Lisa See, Susan Vreeland, Melanie Benjamin. Quite an impressive list right out of the gate. Tell us how this got started. Kathy: I had selected the authors and their books last spring, so we filmed most of the shows in my salon, Beauty and the Book, plus two trips to Los Angeles for Lisa See, Janelle Brown and Fannie Flagg shows and the rest, due to authors' conflicts of tour schedules and such, we just had to do Skype interviews with amazing NEW three-way technology, as the production company was on Skye, the author, a book club, and me, so actually three that you see and one Skype behind the scenes. 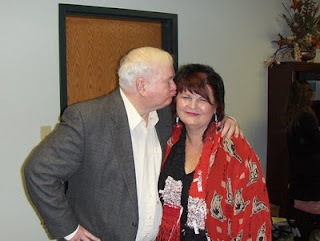 Kathy gets a smooch from Pat Conroy. This all got started when Random House flew me to New York to thank me and to have a conversation on the success of my 2010 Girlfriend Weekend. Their authors Elizabeth Berg, Pat Conroy, and Jamie Ford had sent no less than eight emails telling them that I was changing the publishing world on how we connect books to readers. Through that meeting, Beauty and the Book Show was conceived and now my baby is BORN! My hope and dream is this NEW Online Book Club Talk Show will get picked up by the networks and, while I was celebrating my daughter's 21st birthday last night, Pulpwood Queens and Authors started a new Facebook campaign: PUT THE PULPWOOD QUEEN ON OWN, as they think I would be a perfect show for Oprah Winfrey's new OWN network! I am overwhelmed by the big-share love, but have to tell you, I think this show is perfect for her network too. Beauty and the Book Show is upbeat, positive, shows authors and their books in a new light, I mean, we do makeovers, highlight book clubs, and it's highly entertaining without being trashy or vulgar. Hey, I'm not the Senior High Youth Director for the First United Methodist Church for nothing. I think it's high time we speak out on what television should really be, and Oprah totally gets it! Pamela: You started out with a pretty humble mission: Get people reading. And today, that hasn’t really changed, has it? Kathy: No, my mission has always been to get everybody on the same page; that reading is the highest form of entertainment in the world! One person, one chapter of a book club at a time, we have grown to be an entity that I never ever could have imagined. When I say books saved me, I am not kidding. Reading changes people lives and, for me, for the better. I never dreamed that my favorite thing in the whole world to do, reading, would become not only my life’s passion, but my life’s work. What is that they always say? “Make your life’s work about something you are passionate about and then work will never seem like work.” Every day I bound out of bed as I can’t wait to see where my reading will take me. I am excited about all the possibilities! Pamela: Did you have an idea where you’d land and wind up putting Jefferson, Texas, on the map? 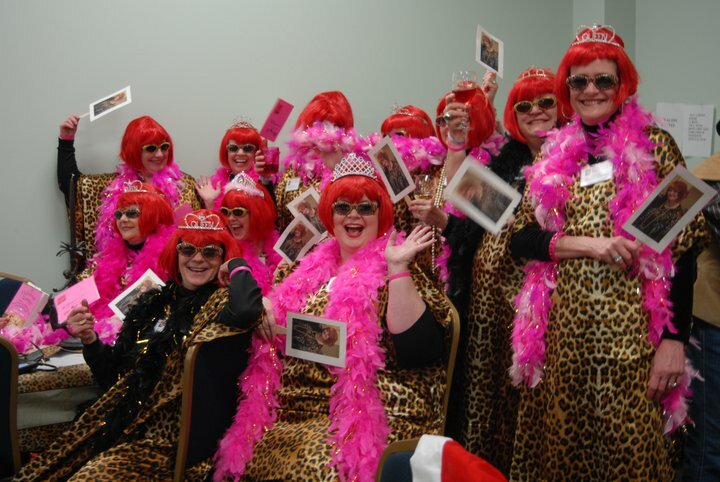 The Pulpwood Queen BB Queens of Jackson, Mississippi! Kathy: No way! I have always been the type of girl who acts on a whim. I get bored really easily, so life has to be an adventure. When I came to Jefferson, Texas, I felt as if I’d found the best-kept secret in the world. Jefferson truly is a step back in time; it reminds me of my magical childhood. It’s a place where kids can be kids, life is slower, people all know your name and your family, it’s a community that has problems just like any other city. But you remember Mayberry, like on the Andy Griffith Show? Well, I call Jefferson, “Mayberry on the bayou.” I married a guy from here and then raised two East Texas girls. I may be a modern woman, but I love living in a town where every little thing you do to pay it forward can make a difference in the lives of others. Pamela: Does the original Pulpwood Queens book club chapter still meet? Kathy: Are you kidding? We had a meeting tonight or at least all the volunteers of my charter chapter, recapping our Girlfriend Weekend 2011, a meeting on how to make it better. I made a big ol’ pot of sausage and chicken gumbo and all my Pulpwood Queens brought all the side dishes and dessert. We love hanging out together and will just make up any old excuse to all be together with our Timber Guys in tow (that’s our husbands). Pamela: What’s on your reading list this year? Pamela: Wow, that is quite a list! I’m in awe that you’ve managed to stay focused on literacy and helping those, who haven’t yet learned to read, develop a love of books. Can you tell us about your work with the Rotarians and other projects? Kathy: I love being in my local Rotary Club because it’s all about “Service Above Self”! I have been literary chair for some time, but when I was president of our local chapter, I started the Dolly Parton Imagination Library Project here in Marion County. I am a big fan of Dolly Parton and her pre-school literacy program was something we were in dire need of here in Marion County as we have a 39 percent adult illiteracy rate. How do you break this cycle? Well, like Dolly, I do believe that if you begin at birth to show that reading is important, you can make a huge difference in a child’s life. This program sends a book a month to a child from birth to kindergarten to get them reading-ready. We just raised $6,000 for this project during our Silent Auction of author donated items during our Girlfriend Weekend to partner with the Rotary Club on a project that I know will make a huge difference. If you teach a child to read well, they have all the tools they need to educate themselves and live a purposeful and authentic life. Rotary International has endorsed promoting literacy, and the Dolly Parton Imagination Library shares that passion, along with their other amazing worthwhile projects such as eradicating polio and helping the world have safe drinking water. If we put all our efforts into more of these kinds of efforts, just think what a wonderful world this would be. I am a Pulpwood Queen and Rotarian for life; these are two organizations besides my church that are really making a difference. Pamela: What books have changed your life most significantly? Kathy: The first book that turned me on to reading was Mary Calhoun’s Honestly, Katie John. That was about a little girl who was very much like me, a tomboy. Then later, To Kill a Mockingbird, as I totally recognized myself in Scout. When I read Pat Conroy’s The Great Santini, I finally knew and recognized that books would be my closest companions. I always felt different, like nobody understood me, and now I know that everybody probably feels that way sometime in life. I was just so very shy as a child and it was hard for me to talk to anyone about this. So when I read books that made me realize that perhaps there were others like me, I felt accepted. Books, authors and readers are now my tribe. To share a book with somebody is the greatest joy, besides my children, that I have had in my life. Not a day goes by that I don’t read a book and find out something about myself that I never knew before. My biggest fear is I won’t have time in this life to read everything I want to read, so heaven for me is an infinite library. How divine is that? Pamela: Anything else you’d like to share with our audience? Kathy: Yes, the thing my 54-year-old self would like to share with this reading audience is find that thing that you are most passionate about and let that become your life’s work. This may not go exactly as you planned but stick with it, whatever it is and don’t let anyone discourage you as long as it’s legally and morally safe. I never in a kazillion years dreamed that I could make my life’s career in books but that is exactly what I do. My second advice is: don’t worry about fame or fortune; invest your life in your passion and paying it forward. Because truly the secret to a happy life is your relationships with others. Gather friends, and you may never be rich but you will be rich in life. And work for what you want, earn it! You never will have better satisfaction in receiving anything if you don’t really work hard for it! And to me, the best way to attain all these goals is to be a reader. Nothing connects people better than the sharing of stories. I know that my life would never been as profound or rich if I had not made my life all about authors, books, literacy and reading. Pamela: We'd love to hear how Kathy Patrick has inspired you or about your own story of how books have changed your life. Leave a comment here by clicking on "comments" at the bottom of this post. And be sure to check in regularly with Kathy on her websites. There's always something new and exciting going on at Beauty and the Book. Great interview! I have just made my fifth pilgrimage to Jefferson, TX for the Girlfriend Weekend. Every year Kathy knocks it out of the park! She not only attracts top names in the industry but also introduces new talent as well. And she is responsible for more than one of her avid book club members to put pen to paper as well. My only worry is where will we meet when it gets too big for Jefferson? When I met Kathy Patrick at her bookstore/beauty salon, I came because as a reader I was intrigued by the concept of beauty and brains. I left with a new friend and knowing I could gather friends in southwest Louisiana together to do something that could be fun and worthwhile. We were still reeling from Hurricane Rita and definitely needed something to lift our spirits. Kathy's book club far exceeded our expectations! I think a What Women Write road trip to Jefferson is in order. I'm so glad you both stopped by to share your stories.